This unofficial Year is designed to be picked up at any point during Term 1. Since Year 3.5 is a transitional booklist, it lacks the historical chronology of the other Years. It is intended to be used as an interim booklist for students who completed Year 3 but need an additional year to be ready for the more advanced pace of Year 4. Depending on where you pick up this plan, you may want to add a book or two from Year 3's Free Reading list for literature to Term 1 (if you begin early in the term) or double up on The Story Book of Science and Geography to catch up to the point where you begin. This plan uses almost all books that are available online for free since many who find that they need this plan will have already purchased Year 4's books and may not have a budget for another year of curriculum. 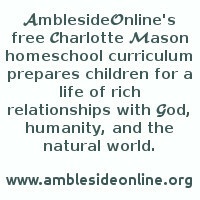 If you're planning to use AmblesideOnline, your first stop should be the the FAQ for some information about the curriculum and basic instructions. It is not advisable to attempt this curriculum without first reading the FAQ. Homeschoolers hoping to raise their children to be readers, as Charlotte Mason urged, owe it to themselves to take the first step in reading by looking over the instructions for the curriculum they plan to use. The FAQ has all the questions that people routinely ask, with detailed answers and explanations collected from two years of responses to user questions. English Fairy Tales by Joseph Jacobs; Tales that should be acceptable for most children are in bold. 6. It is preferable for a child to become accustomed to the language and flow of the King James Version of the Bible, as a familiarity with King James English will make other literature more accessible. Please read Lynn Bruce's article on the King James Version by clicking here. 12. Heroes Every Child Should Know: choose selections; our notes below may help. 12 unspecified chapters are scheduled, but these are longish chapters, so you may prefer to spread fewer chapters over a longer reading time. Due to reading level, this is a readaloud. 17. Stories Mother Nature Told Her Children: This book makes some unflattering stereotypical assumptions about people in other cultures that might have gone unnoticed a hundred years ago, but stick out glaringly today. Chapters have been selected that do not have these kinds of references.